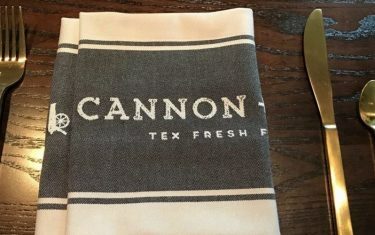 Cannon & Belle sits inside the downtown Austin Hilton in a way that already sets it apart from most hotel restaurants. Part open air, partly enclosed, it’s hard for hotel guests to not realize this beautiful restaurant and bar is there as they’re walking by with their rolling luggage. 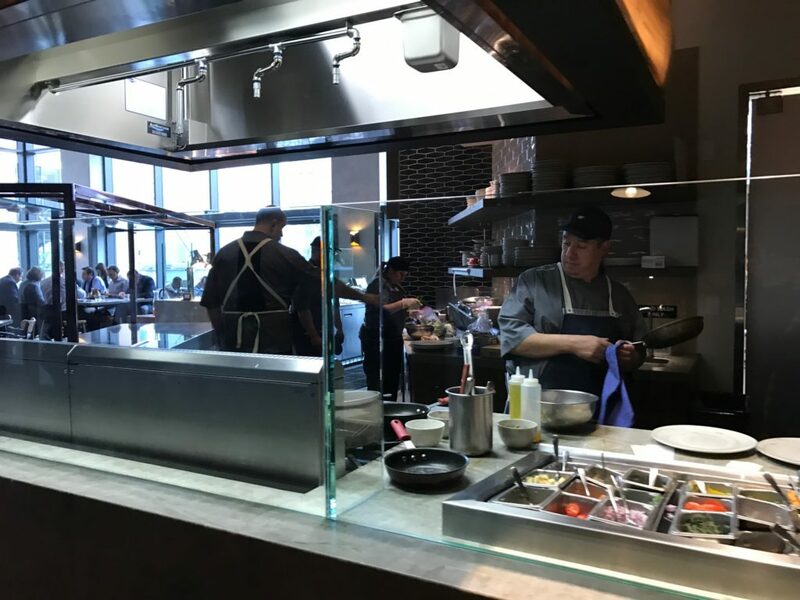 Cannon & Belle’s open kitchen. Photo by Laurie Lyons Makaimoku. The first thing that guests will notice as they enter the restaurant, besides the friendly staff, is the beautiful, expansive bar area that lights up at night as the bartenders become “chefy bartenders,” providing a very interactive experience for guest. Next up is the open kitchen where food voyeurs can watch their food being prepared, all clean, shiny, and fascinating. 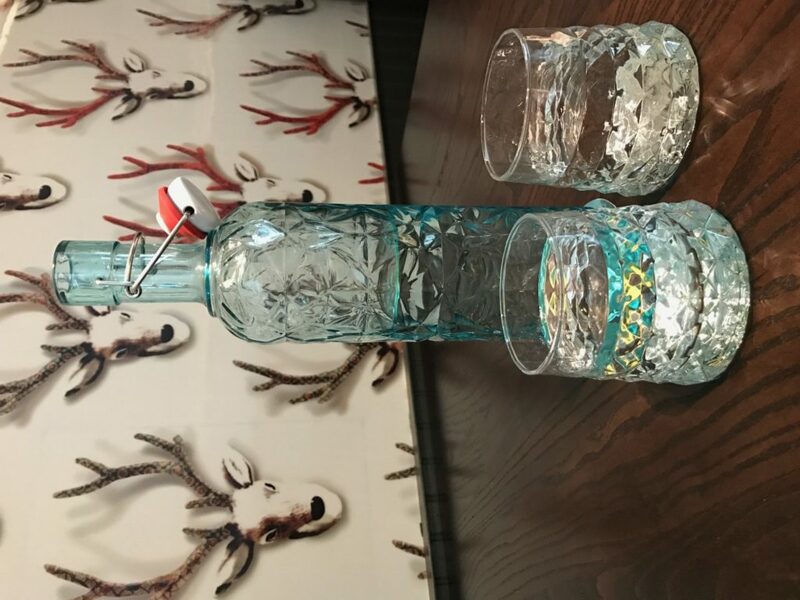 Finally, guests will notice the eclectic, modern yet rustic décor that ranges from 3D wallpaper covered in stags in some of the booths to beautiful contrasts between the turquoise water glasses and the gorgeous gold cutlery that surround the leather-bound menus. Cannon & Belle decor — rustic, charming, modern. Photo by Laurie Lyons Makaimoku. It started very hush-hush. 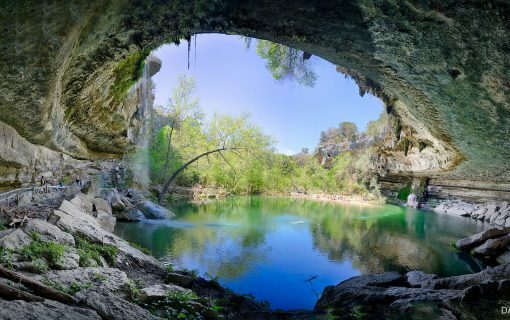 In 1842, Governor Sam Houston ordered the secret removal of the Texas Republic archives to safekeeping in Washington-on-the-Brazos. 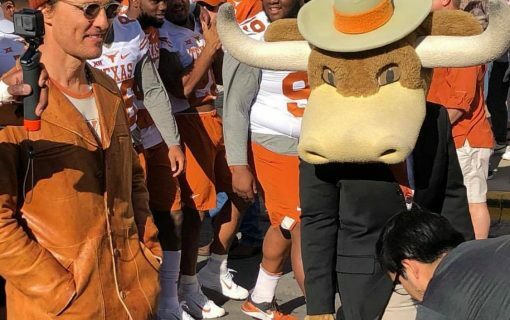 Fearing that symbols of the national government were being removed from the city, Austinite and local legend Angelina Belle Eberly fired a six-pound cannon into the General Land Office Building. It was Belle’s cannonfire that alerted the town to this act of theft, and the conflict that followed became known as the Texas Archive War. 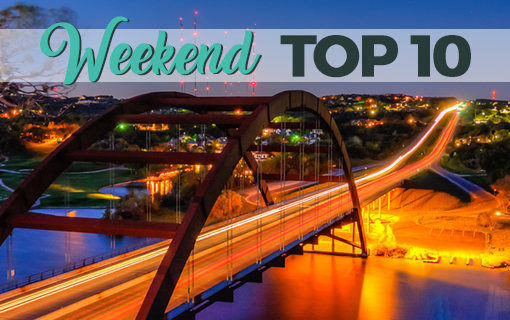 With Belle’s spirit, Austin stayed preserved as the Texas capital and keeper of the archives. The menu may not seem that dynamic at first glance, but don’t let the subtle descriptions fool you – these ingredients are all lovingly harvested and meticulously sourced and turned into really well-crafted and creatively constructed dishes by Chef Peter Maffei, originally from Finn & Porter, who focused on local meets fine dining when creating the menu. His goal was to please hotel guests, as well as provide a place where locals would be excited to dine. In order to do so, he spent an entire summer researching and sourcing his ingredients, many of which are local. Diving right in to lunch with drinks: Since lunch time isn’t the best time to full on sample the beer and cocktail menu (since we’re assuming you have jobs to pay for this delicious meal), it’s a nice time to try some of the other beverage offerings. The Little City cold pressed nitro coffee is a great midday pick-me-up, as it’s much milder and easy to drink than expected. Also, drinking nitro gives you that feeling of being a little fancy, so that helps. Also on the menu is the K Tonic line of kombucha on tap. Now, this reviewer tends to find kombucha absolutely repulsive, but went ahead and went the extra mile for readers — and it was totally worth it. 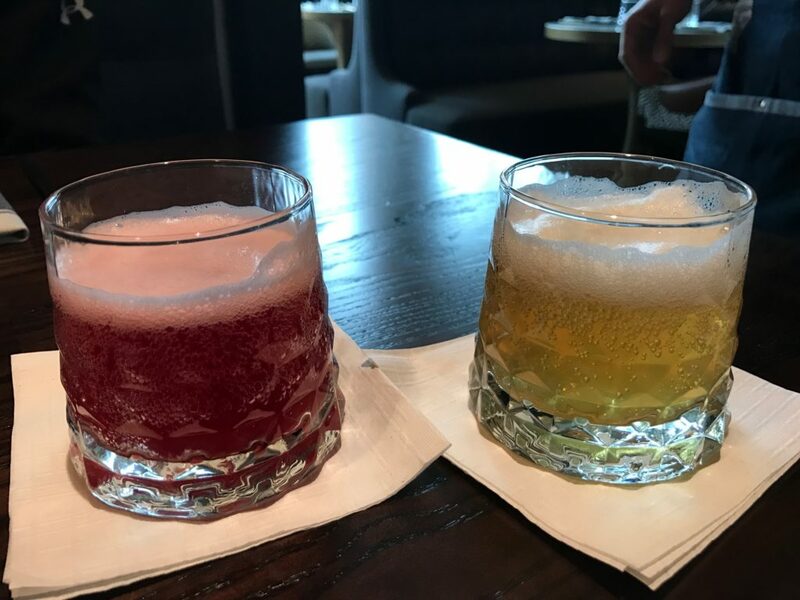 We tried the original (ginger flavored) and hibiscus and both were great, but the original stood out thanks to its clarity, smoothness, and natural sweetness. This kombucha hater may actually be a convert. K Tonic Kombucha. Photo by Laurie Lyons Makaimoku. Of course, if you’re looking for a beer or cocktail to accompany your lunch there is no shortage of choices and creativity here. Few dishes have as welcome a place at the lunch table as the humble Caesar salad, so that’s exactly where this lunch started. The Caesar is a simple salad, a little salty, a little tangy, and just the right amount of crunchy. But every now and then it departs from its standard lettuce, dressing, and garnishes and goes a little more sophisticated, which is exactly what happens at Cannon & Belle, as this Caesar is a little more sophisticated than your standard salad bar fare. 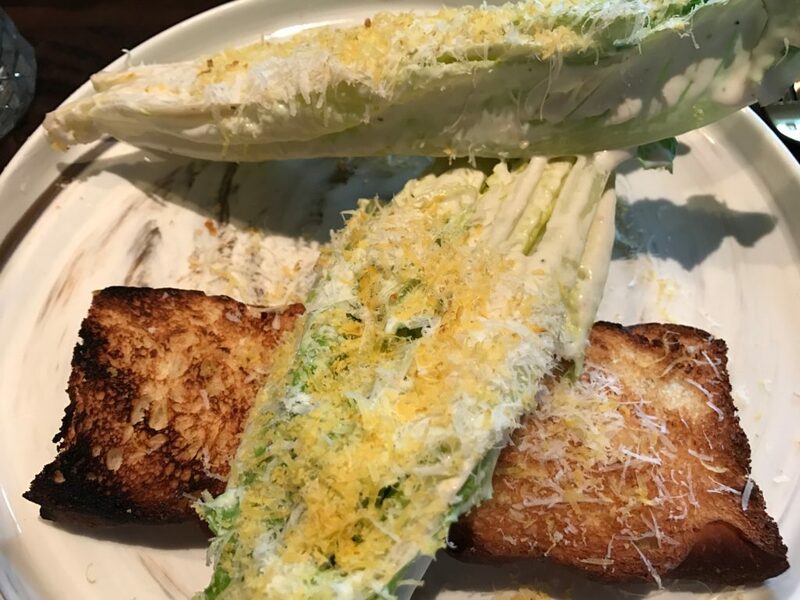 Served with a house-made ciabatta crouton (think more of a fork and knife crispy bread than your standard crunchy chunks), the dressing adds a nice tang with some slight, not overwhelming, fishiness. The standout element of this dish, though, is the egg yolk that is cured, hardened, smoked, and then shaved on top of the salad – because who really thinks to do that? Cannon & Belle Caesar salad. Photo by Laurie Lyons Makaimoku. Not a Caesar fan? The BLT Salad was also very refreshing for what could easily be a heavy starter. The house-made bacon lardons are just divine, and the blue cheese dressing has a tiny bite to it without overwhelming the freshness of the Bibb lettuce or tomato. The pizzas are always a great follow up for lunch, as they aren’t too heavy, but are as fully satisfying as you could hope for. The Spicy Meatball Pizza is Chef Maffei’s grandmother’s recipe, a combination of 50% chuck, 25% short rib, and 25% beef, and one that they highly recommend. 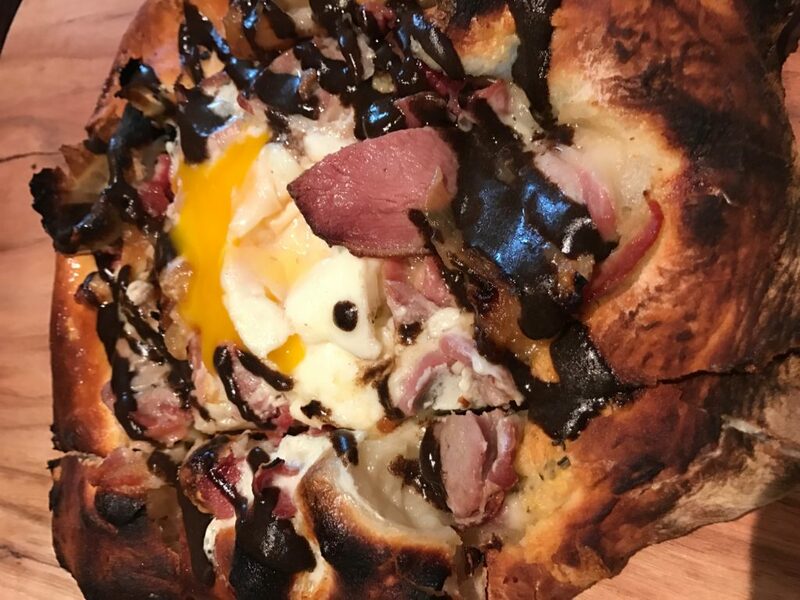 However, we just couldn’t pass up the Bird Pizza, a sumptuous, rich set of ingredients that included bacon wrapped quail sausage, duck ham, caramelized onion, rosemary fontina, and black garlic, all piled atop a woodfire baked dough. The added vinaigrette helps to cut through some of the richness of the ingredients, but it’s the Belle Vie Farms egg yolk that adds it right back in, the perfect cherry on top of this masterpiece. Cannon & Belle’s Bird Pizza. Photo by Laurie Lyons Makaimoku. 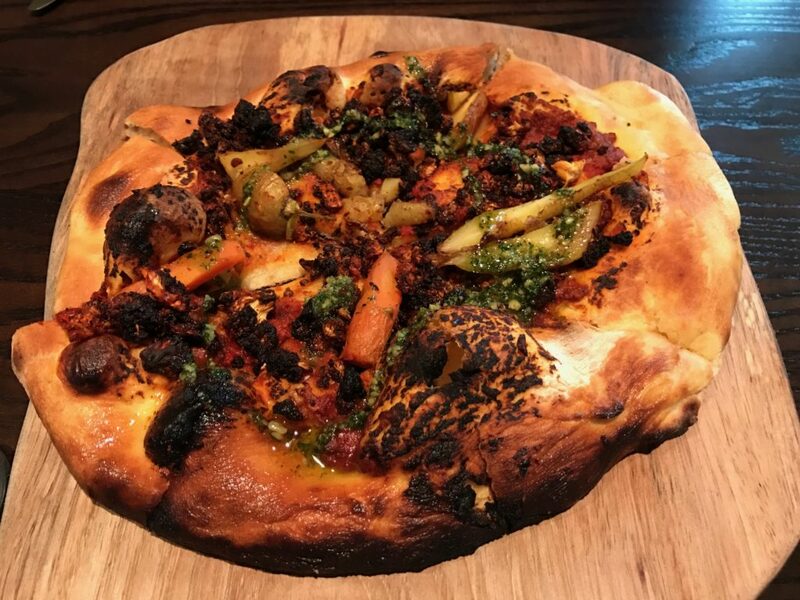 For a vegetarian pizza option, spice up your lunch with the Roasted Veggie Pizza with house-made harissa that adds the perfect kick to highlight the vegetables that include cauliflower and carrots with a walnut parsley pesto. The 600 degree oven that the pizzas are in give the dough a nice chewy, crustiness and adds a beautiful char to the vegetables that lends a flavor all its own. Cannon & Belle’s Roasted Vegetable Pizza. Photo by Laurie Lyons Makaimoku. My only real issue with the lunch menu is the lack of vegetarian options. 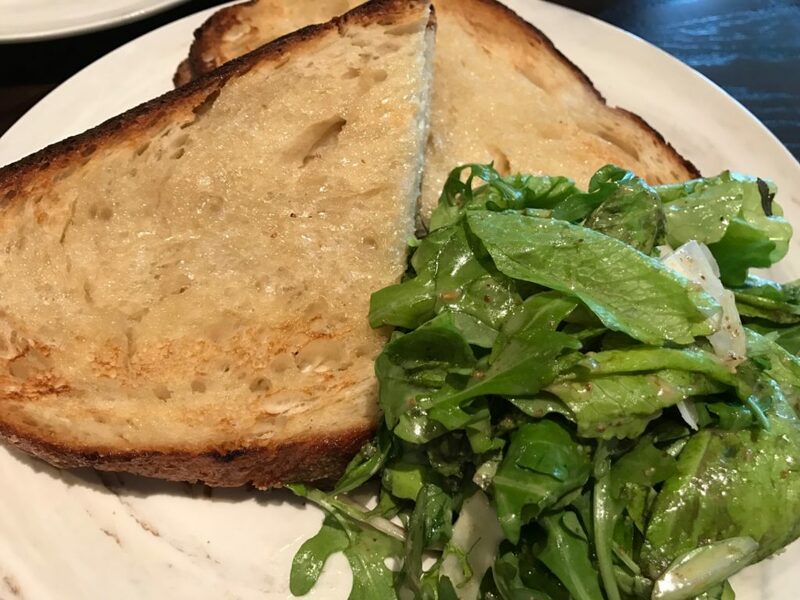 This (primarily) vegetarian reviewer had to modify one of the sandwiches to make it veggie friendly, but it’s kind of hard to go wrong with Brazos Valley brie, butter, and bread together (the sandwich typically comes with bacon) to make up the Baked Brie sandwich. If you leave the bacon on, it comes with thick cut habanero bacon. If not, you still get a sandwich that is so perfectly buttered and baked that your table might turn some heads with the incredibly loud crunch from the bread. The brie coats your mouth so sumptuously, while the Asian pear and superfood greens add a lovely little something extra to the sandwich. Cannon & Belle’s brie grilled cheese. Just look at all that butter. Photo by Laurie Lyons Makaimoku. I didn’t go to lunch alone, which meant I had someone else to try out the wide range of meats on the menu. My companion had the Lamb & Cheese Sandwich, made with lamb ham, goat cheese, arugula, rosemary aioli, and served on a molasses wheat. The lamb for this sandwich is cured, then sous vide to make it tender and not oily like typical lamb. 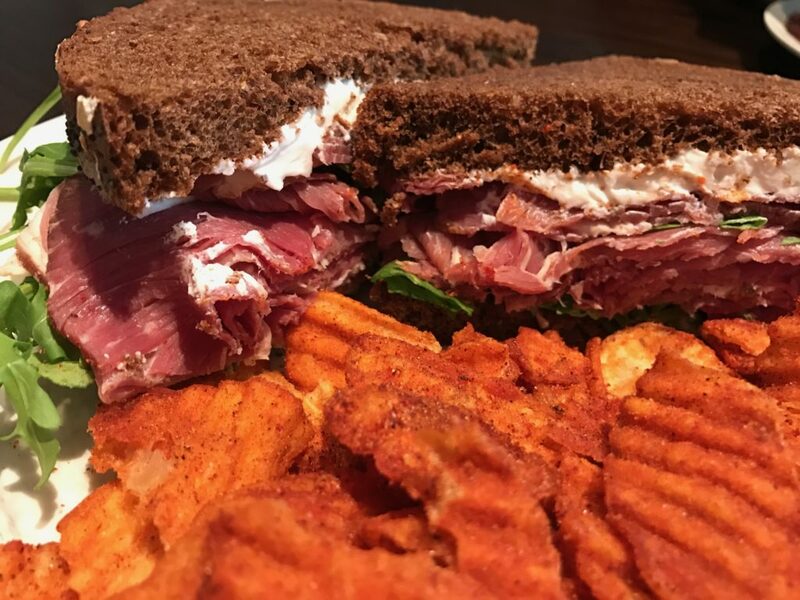 Frankly, this sandwich can speak for itself – check it out below. Cannon & Belle’s lamb & cheese sandwich. Photo by Laurie Lyons Makaimoku. Of course, one doesn’t close out a meal without at least a small bite of sweets, and all of the pastries and desserts at Cannon & Belle are made in-house. That includes, but is not limited to, the delicious, non-processed, adorably homemade moon pies that we had during that day’s lunch. These fun treats went perfectly with the nitrous coffee, and are super portable in case you need something to snack on when you get back to your desk. 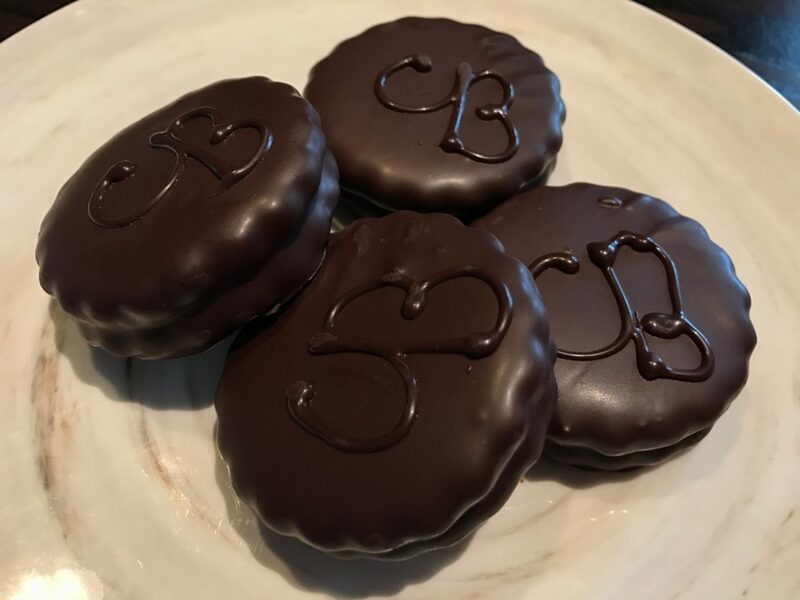 Cannon & Belle’s house made whoopie pies. Photo by Laurie Lyons Makaimoku. In all, Cannon & Belle makes a great stop for lunch (we’ll happily go ahead and endorse it for breakfast and dinner, as well). It’s quiet and open, so it’s a great place for lunch meetings or to bring clients, but it’s also somewhere you feel totally comfortable grabbing a bite to eat and reading the newspaper (or catching up on Austin.com on your mobile) in the corner by yourself.